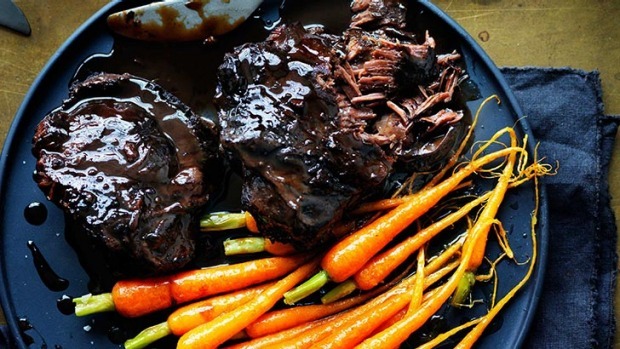 Slow and steady wins for taste, texture and aroma and these slow-braised beef cheeks are deliciously rich. This recipe is a good excuse to fire up the oven and spend a chilly winter afternoon creating a tender masterpiece. There's no need to peel the carrots for this classic, rustic braise; just scrub clean and, using a small knife, scrape away any dirt around the stems. Using a large, deep casserole pot big enough to fit the beef cheeks comfortably, heat 1 tbsp oil on medium-high. Add cheeks, cook until browned, 3 to 5 minutes each side, and transfer to a plate. Reduce heat, warm 1 tbsp oil, then add garlic, onion, celery, carrots and salt and cook until softened, about 10 minutes. Add wine, simmer and reduce for five minutes, then add herbs, bay leaves, both stocks and the pepper. Check seasoning, then return beef cheeks to the pot. Cut out a circle of baking paper the same diameter as the pot, then place on top of meat. Once the stock is simmering, put a lid on, then transfer to oven and cook for about three hours. After the first hour, turn the meat in the sauce, then turn every half hour until the beef is tender. Remove pot from oven, take out meat and rest it on a plate, covered with foil. Strain sauce into another pot. Add baby carrots and gently simmer for 2-3 minutes. Remove carrots with a slotted spoon and continue to simmer sauce until it is glossy and viscous. Heat butter in a large saucepan over a medium-high heat. Add carrots and cook until golden, about 3 to 4 minutes. Return meat to sauce to warm through then serve immediately with carrots on the side.